lpTouch provides mobility and touch screen controls for Logic's commonly used functions on both your iPad and iPhone/iPod touch. With lpTouch & Wi-Fi, you can control record and playback from anywhere in your studio, edit your software instruments, or adjust effects settings. Tired of trying to manipulate tiny controls on the Logic screen with a mouse? lpTouch offers large, usable multi-touch faders and rotary controls to edit send effects, inserts, plug-in instrument parameters, and EQ settings so you can get just the right sound. Mute or solo any track to evaluate your mix during playback. Arm one or more tracks for recording. Know where you're at with the bar-beat display, and track name and number identification. As a universal app, lpTouch has optimized screens for iPhone and iPad devices - no need to buy 2 apps! Screen layouts are also optimized for the size of iPhones, meaning more information is displayed on the larger format devices like iPhone Plus versions where feasible. Use the iOS Settings app to change the look of lpTouch on all devices, either Black or Silver themes. lpTouch uses Logicâ€™s Open Sound Protocol (OSC) control surface support. 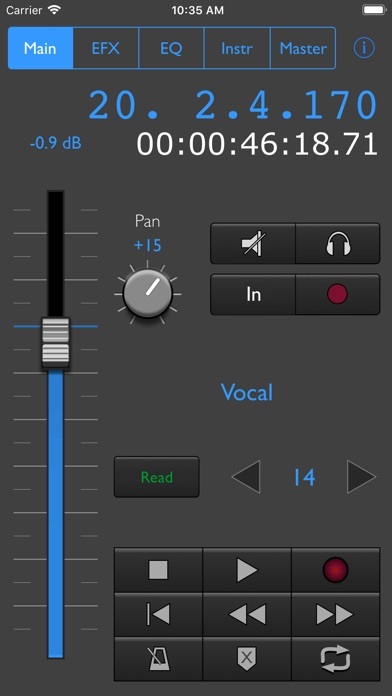 NO NEED TO INSTALL ANY SPECIAL APPLICATIONS OR FILES TO USE LOGIC AND LPTOUCH. All you need is a working Wi-Fi connection between your Mac and your iPad or iPhone. All of this in a small file size app! Apple Logic Pro 9.1.6 or higher (including Logic X) music application installed on your Mac. Preference settings: disable iDevice sleep mode (Autolock); faders "jump on touch"; choose rotary manipulation type (iPad); choose theme style; allow swipe gestures.